Cooking from my pantry lately has been interesting and I'm always up for a challenge, especially when I have limited ingredients to work with. Tonight's dinner was one that was quick and easy... and only involved 4 ingredients! Inspired by a peas and proscuitto pasta dish I saw in a magazine earlier today, I whipped up the following pasta recipe. With some bacon, frozen peas, leftover goat cheese and dried bowtie (farfalle) pasta eagerly waiting to be used, I put it together to come up with a simple pasta dish. The combination of crispy, salty bacon worked nicely with the creamy and tangy goat cheese. For a bit of color, the peas gave a nice pop of green. Who knew such four simple ingredients would come together and make something delicious?! In a large pot, fill with water to boil the pasta. Add a pinch of salt and let it come to a boil. Add pasta and cook until al dente - do not overcook. Once pasta is cooked, drain and place in a large bowl. Add the frozen peas and toss until the peas are heated through. 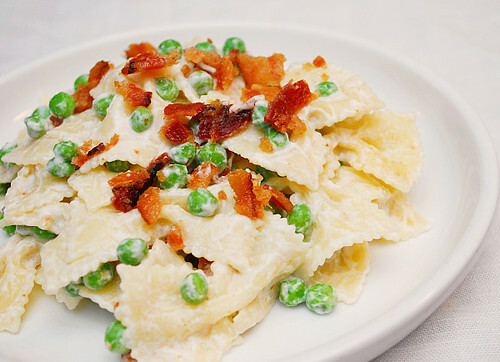 Crumble the goat cheese into the bowl and toss until it starts to melt and coat the peas and pasta. Add the crumbled cooked bacon, toss lightly and serve. I don't like goat cheese. What would you recommend instead? This looks yummy! @American Mom - if you don't like goat cheese, you can substitute it with softened cream cheese... or better yet, an herbed cream cheese.